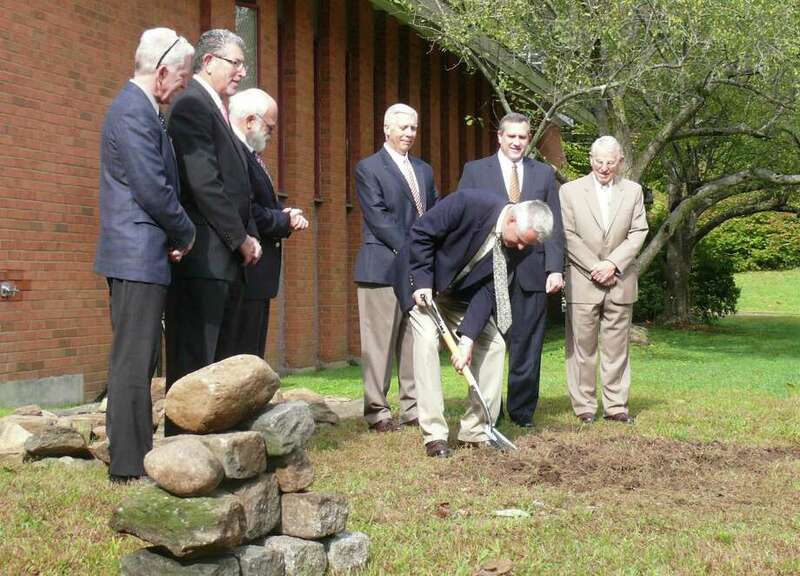 The 12 men each chose a stone, then carefully assembled a pile in front of Black Rock Congregational Church on Monday morning, as church leaders and congregants gathered to celebrate the groundbreaking for the church's new sanctuary at 3685 Black Rock Turnpike. "This is a very exciting time for all of us," said Craig Samuelson, chairman of the building committee, marking the "10 years of prayer and perserverance of many people." The stones were "stones of remembrance," based upon a passage in the Bible when the leaders of the 12 tribes each took a stone from the bed of the Jordan River. "Just as God led his people across the Jordan River, God has parted the waters for us," said Senior Pastor Stephen Treash, as he recalled when the project was first proposed 10 years ago. "We've had our ups and downs, approvals and denials." The stones will be incorporated into the landscaping of the new building. The plans, which initially sparked fierce neighborhood opposition, were revised several times and this year were reduced in size because of the sluggish economy. Construction of the church complex is expected to take 15 months to complete and will be done in two phases. The first phase involves construction of a 53,000-square-foot first floor, while the second phase will be construction of a 17,000-square-foot second floor. A portion of the original church will be renovated and incorporated into the new facility. Architect George Wiles, who is also a member of the church, said the building committee called together land-use experts and consultants so they could rehearse their presentation to town boards to win the final approvals after enduring strong criticism and tumultuous hearings in earlier reviews. The church elders, he said, acted as the town's Inland Wetlands Commission. "I've never been laid so low," Wiles said of the dry-run presentations and the questions the elders posed. "When we went to the wetlands commission, I wasn't feeling very confident, but as we made our presentation, it all came together." The existing building was constructed 45 years ago, and when it was, a time capsule was put together and stored behind the structure's cornerstone. The time capsule was opened recently, Treash said, and revealed "a treasure chest of memories" including photos of Black Rock Congregational Church's first house of worship near Bridgeport's Black Rock Harbor. "We're motivated by the same purpose and same vision that motivated us in 1967," Treash said. "Our vision is to reach as many people as we possibly can." Final services in the old sanctuary will take place Oct. 14. During construction, Sunday services will be held at Notre Dame High School on Jefferson Street, while weekday activities will be held at the First Presbyterian Church, 2475 Easton Turnpike. Church offices have already been moved to 626 Surf Avenue in Stratford. The new church will feature a larger worship center that can accommodate 950 people, a dedicated wing for children's education, an expanded welcome center, two rooms dedicated for junior high and high school students, a cafe, a larger kitchen and a dedicated prayer room.